Officials in states like New York are already sounding the alarm on lost tax revenues due in part to migration to Florida. In a press conference Feb. 5, New York Governor Andrew Cuomo for the first time divulged the economic pain his state is finding itself in, now that it faces an exodus of property taxpayers. New York’s state budget officials said that in the last year, tax revenue was about $2.3 billion below projections and would necessitate a significant budget overhaul. Other states like New Jersey and Connecticut also recently reported large gaps in tax collection figures for 2018. While there isn’t much data to prove this theory definitively, the revenue shortfalls being seen in these states are likely the result of recent federal tax law changes that encourage more homeowners to move to states with lower tax burdens. Florida and Miami specifically appear to be the top benefactors in this trend. The Sunshine State saw the highest level of net domestic migration of any state between July 2017 and July 2018, according to Census Bureau data. Over the same period, New York made the top of the list for population loss. In New York and much of the nation, home values and sales grew only modestly last year, if at all. Meanwhile, sales in Florida and Miami came out ahead of the national average. 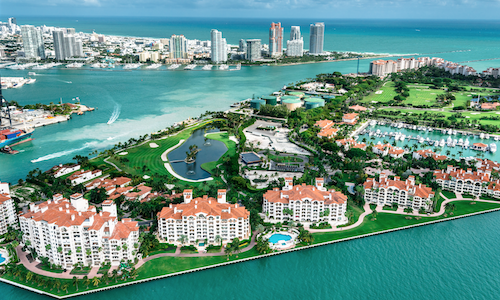 Nelson Gonzalez of EWM International Realty closed on a $17 million sale that broke a two-year price record for a home sale on North Bay Road in Miami Beach. The new construction, 10,665 square foot home at 6010 N. Bay Road was sold to New York developer Peter Fine, according to a press release. Remember the building on stilts? The Allapattah development that could become something of an architectural landmark in South Florida is a step closer to being realized. The project, designed by architects at Bjarke Ingels Group and led by developer Robert Wennett, received approval from the Miami Planning, Zoning and Appeals Board Feb. 6. It’s currently the site of several storage warehouses for Miami Produce, but plans call for a massive complex of four buildings stacked upon one another, with a combined 1.4 million square feet of retail space, rooftop gardens and residential units. The plans also call for what would be the first co-living development in the Miami area. The proposal still needs to earn approval from the Miami City Commission before building can begin.